Frankly speaking and not for getting right on a situation, getting the encke division in a 9" is a little too optimist for, not to say more. The results with the comparison with cssini div, shows that this 14times about a 2", meanning 700mm to see the encke in the same condition of contrast; cass div in a 2" is near a limit of visibility but accessible without effort. Calculations shows a 5% contrast level for a 10". Who can see this contrast with a perfect scope, so to have a perfect scope is what? To get one from a store? pfutt. Nake eye test on a target retaking the conditions at the eyepiece remains with no result, with a 9" scope and the related magnification at the basis to say that. These conditions 225mm and 500x makes the angle of view at the eyepiece un enough to distinguish the width od the division with the eye. Observations at a good 330mm scope installed above the ground thermal agitation of the air, makes no encke division seens under stable images and the rings well openned with 600x at the eyepiece. A ccd photo done with a 11" showing encke as artefacts like edge effects and not the division. All ccd observers did this kind of pictures with such artefacts between 8 and 16". Conclusion, I cannot be under an optimism which does not demonstrate something actually consistent and but reluctant to be in assessment in regards to other investigation methods, which are simple. Encke under your considerations is not, and actually not. Let me ask you this, in your opinion, what is the smallest aperture that you think will show Encke? By the way, let me also point out that my 9" refractor is not a 'store bought' refractor. It is an Alvan Clark refractor. That's about as good as it gets. You're no doubt familiar with the name. It's also helpful to look at some high resolution photographs of Saturn. I've blown up a portion of a super-high resolution image of Saturn (not from an earth-base telescope!) that shows the Enke and Cassini Divisions. 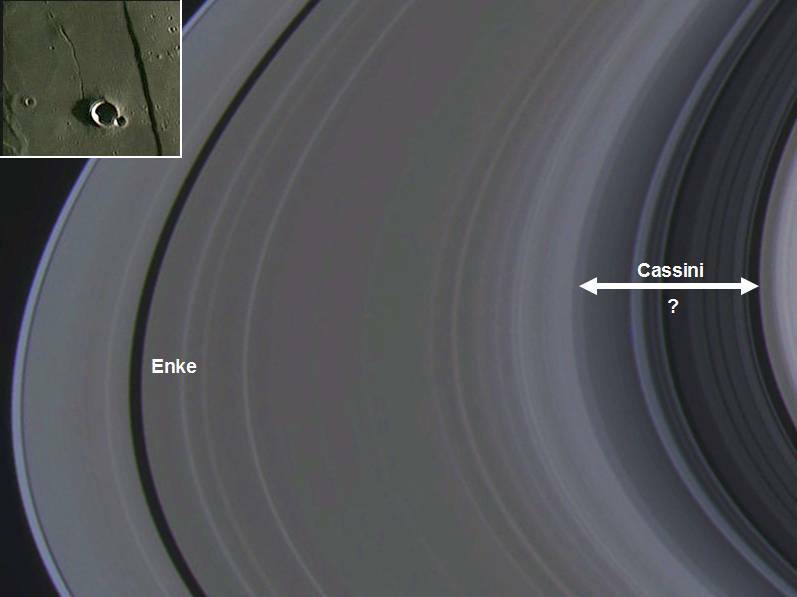 One can probably argue exactly how wide Cassini is, but when testing this against looking from a distance, I certainly get the impression visually that one takes in all of the "sub-rings" designated by the arrow here as being the "Cassini division". If you compare the width of that with the Enke division, we're talking about a 15:1 ratio in size. This is a significant difference. As a point of comparison (bad ones to be sure! but it makes a point) the difference between the central craterlet on the floor of Plato (not exactly easy to see) and the largest crater on the floor of Clavius (visible in binoculars) is only about 10:1 (yes, the Plato craterlets are much lower contrast, etc. etc., but this is about size). I've put an insert at top left of a 11:1 difference - Rima Birt is about 1.5km and the crater Birt is 17km. So a 15:1 difference is pretty substantial. Clearly anyone seeing Enke should report that they could drive a truck through Cassini on that night. The photo is interesting from another perspective though, and that is that the Enke division shows superb contrast - quite a bit better than Cassini and obviously that would work in favor of distinguishing it. But when all is said and done, and one looks at these high-resolution photographs, one has to say that catching the Enke division is clearly an extraordinary accomplishment. Ok, it looks like you don't believe a 9 inch will ever do it. That is fine, but again, the limits imposed by diffraction may indicate that there will be times when it is possible to see the Encke division in a 9 inch. Such a comparison is ridiculous. The two divisions are *vastly* different. You can't just "scale" up the aperture based on the width of the two divisions. The Cassini division is about 4500 km wide. The Encke division is 325 km wide, which is a factor of 13.8 difference, but that does *not* mean you need a scope 14 times larger in aperture to see it! You keep missing this. To see a dark line against a wide white background with a given telescope requires only 1/14 of the aperture that would be needed to resolve the actual width of the division. The Cassini division is visible in a 2" aperture even though the division is only 1/3rd the angular width of the resolution of a 2" aperture. It would be visible in an even smaller aperture if it were all by itself in a big white background, but it isn't. It has the darkness of space at the outer edge of the A-ring to cause problems. This space causes diffraction effects which at apertures smaller than 2 inches cause it to blend into the darker outer part of the A-ring. The same thing happens with the Encke division, only this time, apertures much smaller than around 9.2 inches tend to have this diffraction blending happen. It is what is around the division that determines whether it is visible. Where did you get this? What calculations? Also, one does *not* get an Alvin Clark 9 inch refractor from a store!! These were some of the finest custom-figured telescopes that were ever made (produced in the late 19th and early 20th century). In addition, my 10 inch f/5.6 has a custom-made 1/20th wave primary mirror (Enterprise Optics), and is my own creation. These are first-rate optics and not some cheap product of some mass-market telescope factories. We are viewing WITH A TELESCOPE!!! The naked-eye performance is only secondary, as the magnification brings the image scale up to where the eye can easily view it. To make the angular distance between the outer edge of the A-ring and the middle of the Encke division equal to the resolution of my own eye (around three arc minutes) requires 363x. I have only glimpsed the division at powers of that level, as usually, I am pushing 450x when I look for it in my 10 inch. As long as the scope itself has the resolution needed to separate the division from the outer edge of the A-ring, the scope should be able to show the Encke division at those powers. If you personally have not see the Encke division, then that is unfortunate. However, this does *not* mean that it is impossible to see in a 9 or 10 inch aperture telescope. These were taken with a 14 inch (356mm) aperture SCT. Even his early images take in a 9.25 inch SCT tend to start to show hints of the division, although it is nowhere near as clear as Damian's C14 images. The details have few artifacts, as the locations and appearance of the dark gap in the outer A-ring match that of the Encke Division. Sorry Stanislas, but I am afraid you just haven't made your case here. Clear skies to you. I am sorry but you donot answer actually. 5% contrast on a 10" is ridiculous to see. Come back on the photonov. post for a 0.1" division and apply for a 0.05" division means to double your 9"
means 18" to get more than 5% which is not 10% but a little more. You will be near the actual answer in spite of your 9" not at a store. And this shall not be seen by anybody in a such 18", perfect! Dpe images shows at the evidence artefacts nothing else. You may read the posts above and objections also through tests that you can perform yourself that will not be convergent with the supposed view. I will not take again a post, this is useless to speak about also visual artefacts still. Are you saying it can or can't be seen in a perfect 18" scope. I'm not clear on your intent. I know you're saying it can't be seen in a 9" or 10". There is an old saying that goes, "If it looks like a duck and quacks like a duck then it's a duck." Most people looking at Damian's picture would conclude that there is a division at the outer edge of the A ring. Since we know there is a division it is not unreasonable to conclude that what looks like a division is the division. If we see visually what looks like a division where there actually is a division then it's the division. My regrets also that you have never seen the division in the 330mm telescope 50 meters above the ground. I simply think you don't have the type of conditions required at your location to see it. Probably not in any telescope. I think this is a case where your model needs modification to consider observations. So, for example, jpegs have image artifacts due to compression and lens flare in an image is also an artifact as in both cases the final image is not recording evidence of any actual structure existing in reality. Also, the A-ring minima, often seen, is also an artifact, visual or photographic, as there exists no real ring feature to which it can be ascribed as an indication thereof. On the other hand, in the case of the shading arcs located exactly where the Encke division actually *is* (in reality), this would usually be considered an "indication" of an actual feature rather than an artifact indicating an un-real feature. I say "usually" because processing errors or shortcomings could possibly mimic certain discrete features that would, in a better quality image, be clearly seen as actual indications of an actual feature. I think the Peach images which show an arc at the location where we know the Encke division to exist, are indications and not imaging artifacts--i am pretty certain no imager, amateur or professional, would disagree with this assessment of this case. An analogy of artifact, indication an resolution might be helpful. Let's use stars. A star is actually an indication not a resolution, at least in the amateur case, as no star can be technically resolved telescopically as all are simply too distant too see as a disk--which would be required to call them "resolved". But there *is* an actual cosmic source of light in the same location that we see a light source indicated--which we call a star--and so no one calls stars "artifacts" of vision or imaging even though they are certainly unresolved. Alternatively, get whumped on the head and those stars will be artifacts! Another example is power lines. One can accurately detect indications of existing power lines at distances far beyond that which the 1minute of arc resolution capability of the eye would indicate to be possible. To provide an example, a one inch transmission line, if linear detection was truly limited to 1'arc resolution, would disappear at a distance of just over 100 yards- Obviously this is not the case. In fact, studies dating from the visual astronomy era (THE VISIBILITY OF SINGLE LINES AT VARIOUS ILLUMINATIONS AND THE RETINAL BASIS OF VISUAL RESOLUTION, Hecht & Mintz, Columbia University 1939, a paper which continues to garner citations into this century) indicate that the unaided eye's detection capability for linear features can reach as high as 0.5"arc under optimal circumstances--that would exceed Rayleigh for a 2.5mm pupil (55"arc) by 110 times. Another point is that in the case of any planetary detail that lies at the absolute margins of observation, like Encke's, the ruling element in the detection equation is not aperture but seeing. IOW, the foremost requirement is optimal seeing, for if that is not sufficiently excellent, it does not matter what aperture is used, the indication will not be seen. Astronomers have been throwing excellently corrected aperture (to 200inches) up against visual planetary detail for many decades and the results of that effort is retained in the historical observational record. Plain in that record is the fact that it is seeing that sets the limit for both resolution and detection of an indicated feature, with useful aperture inextricably tied to the limitations prescribed by that prerequisite. IOW, for my part the key to accepting Siegfried's observation is the exceptional seeing state which he described, occurring in an area (high altitude desert southwest) documented professionally to be within the realm of possible seeing states down to and including 0.5"arc median. The same report, but from, say McCormick Observatory in suburban Charlottesville, Virginia, even using a 26inch Clark refractor, i would not credit--as the seeing there almost certainly never falls below a second of arc and thus automatically precludes such fine observations. Thank you for that detailed analysis. I wish I could have said it as well. Ecellent analogies. Thank you photonov for your wording explanations. I was not aware that scintific explanations were also narrow or so closed to the wording and so distant from the tests and calculations actually. If you don't like artefact, take edge effects, that's. Good luck and good skies to all for finish. I've seen Encke once. My friend and fellow CN'er Lawerence Regira has a 12.5" modified Cave reflector. Using a 7mm Nagler and magnifications over 600x under NELM 6 skies, we both saw Encke quite easily on one occasion. This was over a year ago when the ring tilt angle was more favorable. Encke was clear and sustained - there was no question we were seeing it. It's one of my observing highlights and it ranks up there with the first time I saw Trapezium E in my own 6" scope.